Need a gift for twins but don't know what mom is having? No problem. 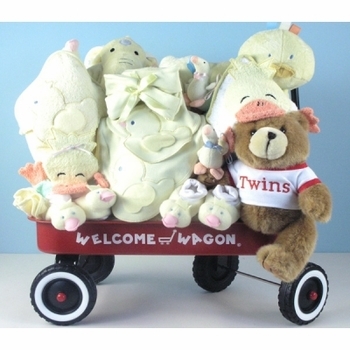 Our ultimate wagon set has a lot of cute necessities for both babies, all in unisex, neutral colors. Beautifully wrapped, Mom and Dad will appreciate all the gifts for their twins that are both functional and fun! Please note: the metal wagon shown in the photo above has been replaced by a larger all wood red wagon. Please click on the More Images tab to see this new upgraded wooden wagon.